While watching last week’s episode of HBO’s Real Time with Bill Maher, I was introduced to something of profound consequence to most of the clients we serve in the US. Many of our client’s businesses suffer from being unable to find skilled labor for key parts of their business. This is quite profound given the fact that so many people in the US remain unemployed or under employed despite there being so many unfilled jobs at present. 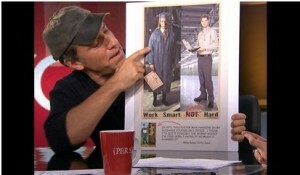 Mike Rowe of the Discovery Channel’s show “Dirty Jobs” was a guest on Real Time and announced a new initiative he’s taken on under the name “Profoundly Disconnected”. Mike’s work on the real-life set of Dirty Jobs has made him conscious that there is indeed a profound disconnect between how young people view viable careers as opposed to what employers are prepared to offer. Mike goes on to challenge the premise that an expensive four-year university degree is the best path for most young people to launch their careers and there is ample evidence of a growing roster of unemployed or under employed college graduates. His mission includes confronting outdated stereotypes that drive many parents and kids away from a long list of worthwhile careers that in many cases, pay substantially more than careers aligned to university graduates. If you have a stake in recruiting talent for your organization and any of this resonates with the challenges you’re facing, then I highly recommend a visit to the Profoundly Disconnected (www.profoundlydisconnected.com) website and possibly look at how your company can participate in this worthwhile endeavor. Mike makes his case throughout the website with both humor and statistical data. The photo below is one of his promotional campaigns where he recreates a poster that he recalled hanging in his high school guidance counselor’s office in 1977. 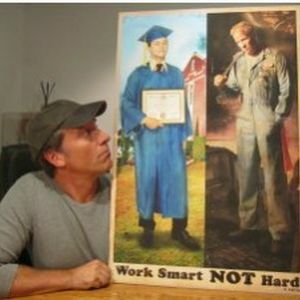 The poster was part of a college recruitment campaign called Work Smart Not Hard. Mike transforms the poster (see below) into a present day message of “Work Smart AND Hard” to suggest that we’ve tried to separate hard work from achieving success which has exacerbated the current gap in available skilled labor. In addition to the many competitive challenges that US executives face in a global economy, the massive skills gap is one of the worst to contend with. China and other countries are turning out record numbers of young people with engineering and / or technical certifications, while US employers are having to lobby Congress to get more work visas for foreigners. Despite record unemployment, there are still millions of skilled jobs that remain unfilled because no one is trained or worse yet…. no one is willing to do them. Mike’s working to change this and I think he’s on to something beneficial for both employers and the unemployed alike. He’s created a non-profit foundation called mikeroweWORKS (www.mikeroweworks.com) that’s a veritable portal of information on the skilled trades along with available scholarships. There’s a real opportunity to inform parents, school guidance counselors and kids alike that there’s just as much reward and dignity in a skilled trade as there is in careers originating from a four year degree. And as for employers and what they can do? It appears that Caterpillar is one of Mike’s biggest partners in this initiative and I know they aren’t supporting his initiative out of charity alone. Caterpillar advertises technical career opportunities at Caterpillar dealerships that lead to six-figure compensation within a few years of gaining the technical education and on-the-job experience. Their campaign reflects the opportunity for aptly skilled young people to achieve a stable and rewarding career and Caterpillar to achieve the growth they need to sustain one of the planet’s biggest brands. I was so profoundly inspired with Mike’s new initiative that I’m challenging everyone that has a stake in acquiring talent and building a strong employment brand to explore these websites. If you think you have a better idea on how employers and educational institutions in the US can work together to promote the skilled trades and ultimately reduce this massive skills gap, then I’d love to hear about it!